MEN'S SILVER NECKLACES : BRITISH Made : LOVE2HAVE in the UK! The Best! 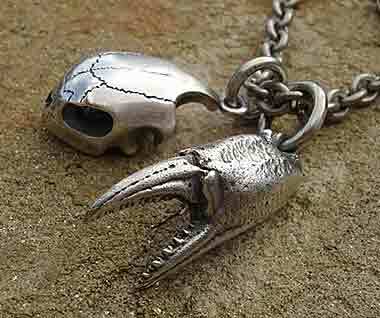 British made men's silver necklaces all handmade in the UK at prices you can afford. Fully guaranteed and returns accepted. Our men's sterling silver necklaces are all based on the classic design of a silver pendant threaded onto a silver chain. Silver is the most popular choice for this type of men's jewellery, and all of these pieces come with the chains as pictured. We tend to find that most men wear an 18-inch length necklace as this hangs just at the right point below the collarbone, not too low as to be obscured by outer clothing, and not too high so to be uncomfortable or irritating to wear. Being all handmade and not mass-produced we are happy to, cater for other lengths if required, and there is no limit to size. Just let us know what you need, and we can find out if it will cost any extra which is usually only a minimal difference. Prefer a non-leather version of one of our men's silver necklaces combined with leather?